We eat a lot of rice in Mexico and is often served with chicken, soup and more. It can be red, green, or white depending on what we are serving it with. This recipe isn’t Mexican, but if you are looking for another way to prepare your rice, you are in the right place and you will love this! The day that I got home from the hospital after giving birth to our second son, my mother-in-law very kindly offered to bring us dinner. 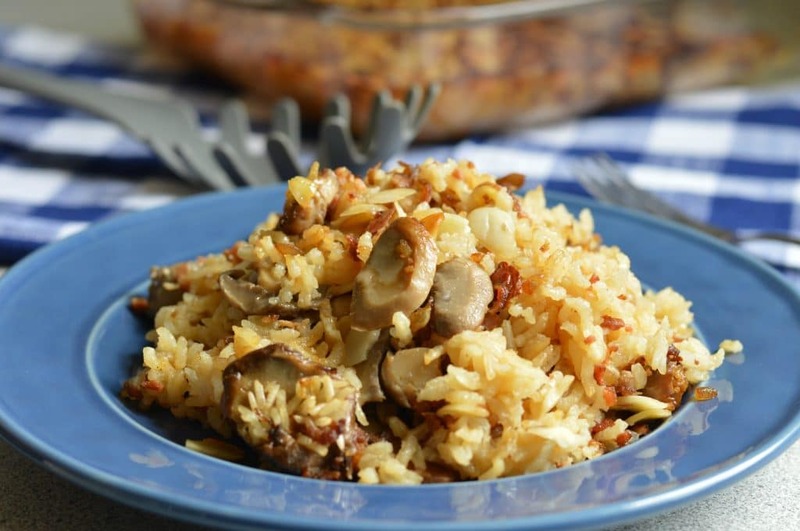 She brought a delicious meal consisting of Parmesan chicken , salad, and as a side dish – this delicious rice recipe which has mushrooms, bacon, and almonds for an added crunch. Being that I love rice, I absolutely loved this dish! After trying it for the first time, I immediately asked her for the recipe and with her permission I am sharing it here now. 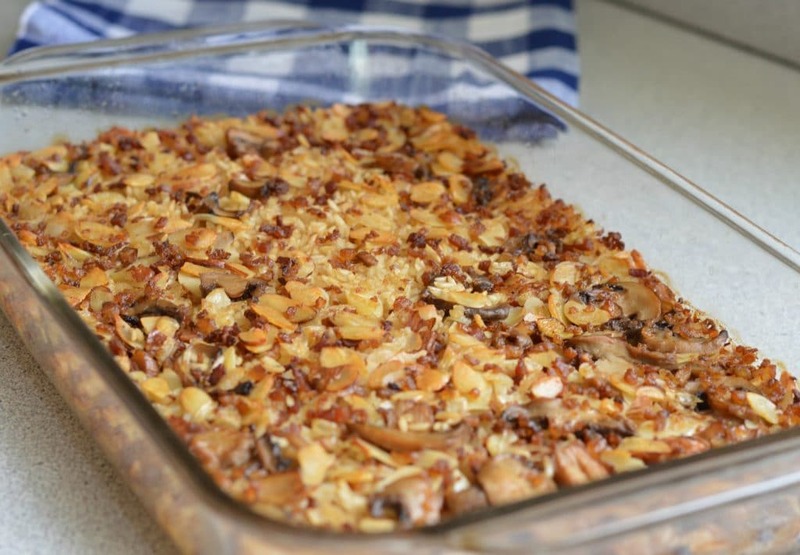 It is very simple to make like most of my other recipes – all you have to do is saute the ingredients, empty them into a baking dish, and cook for one hour. There are so many things that this would go well with – including my delicious easy mole (mo-lay) recipe. When I asked my mother-in-law where she got the recipe I was surprised! My sister-in-law was a missionary in Armenia, so I assumed that that is where it comes from, but she told me that she actually had gotten the recipe years ago at a church activity! Like I mentioned above, in most south and central American countries rice is a staple that is served with many different kinds of food and is usually cooked with some type of fresh sauce. 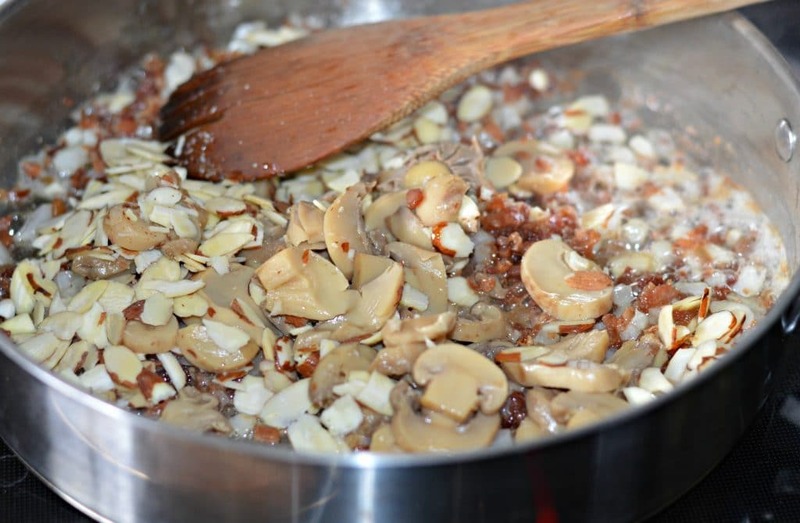 This version, however, does not have any sauce at all, but it is still absolutely delicious The almonds give it a great crunch and together with the bacon it has an amazing flavor combination. 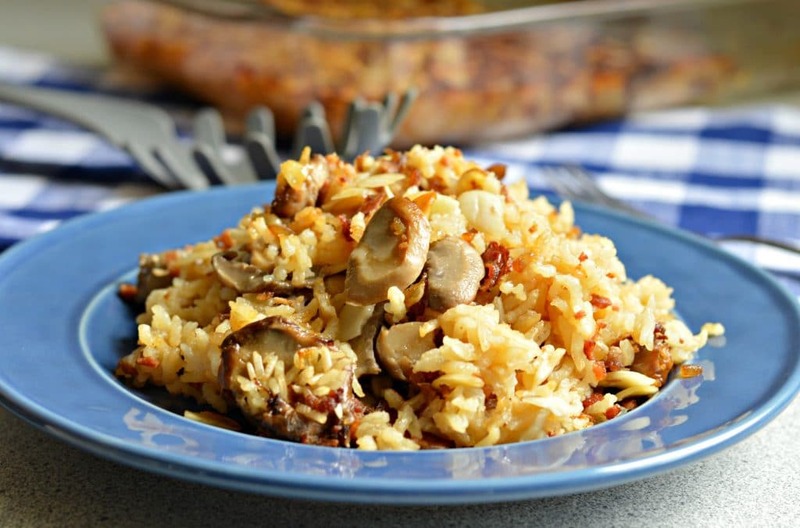 I have to admit, I don’t only like this rice because it is delicious, but also because it is foolproof – if you follow this recipe, it will come out perfectly! That motivated me to put it back up right away and now I hope that you all enjoy it too! 1 Small package of Bacon Bits or you can make your own bacon and crumble it. 1/2 Cup of finely chopped onions. 1 Can of mushroooms drained. 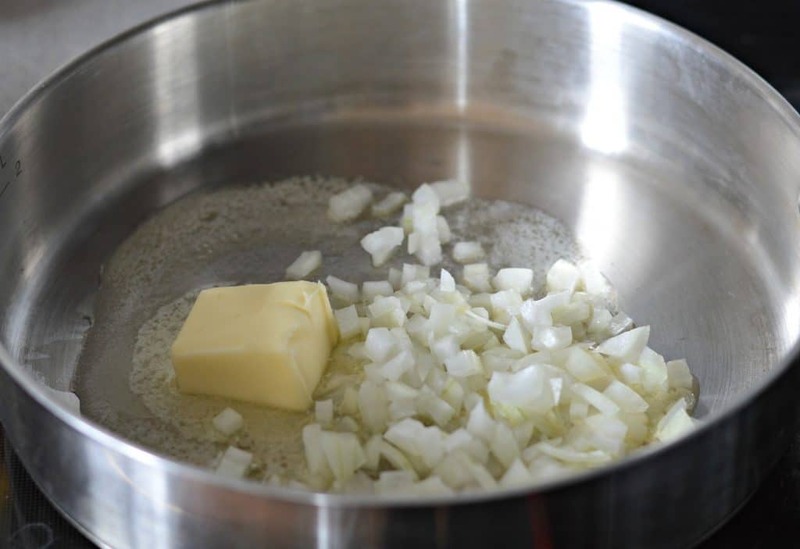 Saute the onion in the butter until translucent, add the bacon bits, and mix well. Add the rest of the ingredients, mix well and let cook for another minute or two. Empty everything into a 9 x 13 baking dish and bake uncovered at 350 for one hour. Remove from the oven, let cool slightly and enjoy! As a side dish this can easily serve 5-10 people i would say, and probably more depending on how hungry everyone is :). If you fry your own bacon, how much should be used? Also, how long do the ingredients need to be sautéed for? Thanks. Hi Kenia. If you are going to make your own bacon (which is a great idea!) you should probably use about 4-5 slices at least. You can always use more or less depending on your own preference, but that sounds about right to me. You should just saute the onions until they are translucent, probably 3-5 minutes and then add the bacon and stir well. Then add the rest of the ingredients, mix them all together and let it cook for another minute or two. I will update the instructions to clarify that point. Thanks for asking and let me know how it turns out! Hi Laura – it is the regular sized can! Thanks for asking. What type of rice do you recommend for this? What size can of beef stock…how many ounces? Hi Carol, this should be a 14 Oz. can of beef stock. Thanks for checking! Is the rice cooked or uncooked? 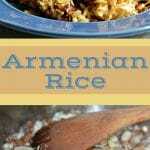 When you add the rice it should be uncooked, and it will cook when you bake the casserole. Sorry for the confusion and I just updated the recipe to say “uncooked rice.” Thanks! Thanks Bonnie! Yes, it is 9×13. I will update now.